To clean wastewater, most municipal treatment plants try to maintain an oxygen concentration of 2 milligrams per liter in their aerated tanks. 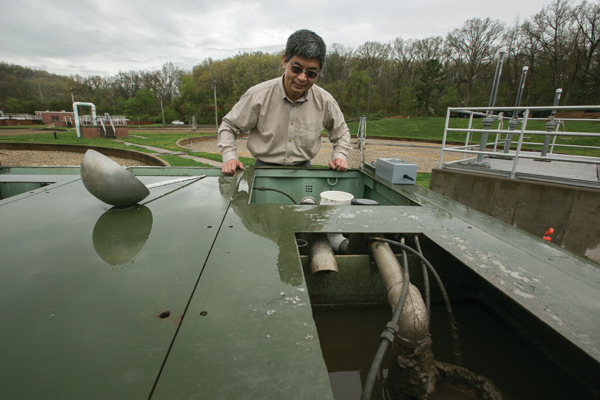 That seems ideal for the microorganisms that consume the waste; it’s a level that “makes them happy” and well fed, says Jianmin Wang, professor of civil, architectural and environmental engineering at Missouri S&T. But putting those bugs on a diet can save energy in those treatment plants and lead to cleaner water. It also makes slightly less happy microorganisms that live longer. Research suggests that providing less than 2 milligrams per liter of oxygen would make the microorganisms “unhappy.” But Wang says that if you feed them at a lower concentration, such as 0.5 milligram per liter, the bugs are only a little less happy but will live longer and enrich more. Plus, putting the bugs on that restricted diet uses 30 percent less energy during oxygen infusion to produce the same results. That’s the key to one of Wang’s new wastewater treatment technologies to produce freshwater that is cleaner than wastewater treated using traditional methods and requires less maintenance and energy. Wang says 0.8 percent of America’s energy use is spent on wastewater treatment. Much of that energy is used to aerate the tanks where wastewater is treated. The energy is used to feed oxygen to the microorganisms that consume the waste. Wang also developed a treatment system called an Alternating Anaerobic-Anoxic-Oxic process that can remove organic pollutants, nitrogen and phosphorous nutrients without chemicals, and a small-scale deployable baffled bioreactor that could treat wastewater in military battlefield camps.